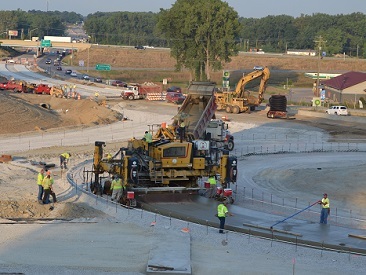 The Indiana Chapter of the American Concrete Pavement Association (IN-ACPA) represents the concrete pavement contractors, cement manufacturers and related material and equipment suppliers serving the concrete paving industry in Indiana. We provide technical, educational and governmental affairs services advocating the use of Portland cement concrete pavement (PCCP) for highways, airports, local roads and streets, and site paving installations. Established in 1988 as a chapter of the American Concrete Pavement Association (ACPA) we are a not-for-profit trade association (501(c) 6) based in Indianapolis under the direction of an annually-elected Board of Directors. We work in partnership with federal, state and local agencies, designers, scientists and others involved in research, planning, design, construction, maintenance and rehabilitation of concrete pavement. This web site is intended as a resource for those wishing to learn more about concrete pavement and those who build it in Indiana. You will find numerous, useful links and publications available through this site, but if you can’t find what you’re looking for, please don’t hesitate to contact us.